Let's start with the obvious: Baby corn is small, adorable, and yellow. What's less obvious is just what the heck (young corn are present, keep it PG) baby corn is. Is this the runt of the maize litter? Are they cut down like baby carrots? Is a shrink ray involved like in that beloved movie about parental negligence? We're going to answer those questions, which are admittedly one question, along with a few others, and we're not going to make a single "maize" pun in the process. Well, friends, we're happy to announce that baby corn is in fact young corn. It may be harvested prematurely, but much like a young Mozart or a young Sheldon, it's shockingly versatile and developed for its age. So let's go over just how in the science a stalk becomes corn: Basically, the stalk produces female flowers (the ears) and male flowers (that tassel thing on top) and matures when pollen from the male flower makes its way over to the female flower, pollinating the female silk. Each one of these silks yields a single kernel; each one of these kernels is designed to stick between your teeth. Baby corn is stunted because it's harvested right when those silks show up -- it's un-pollinated. 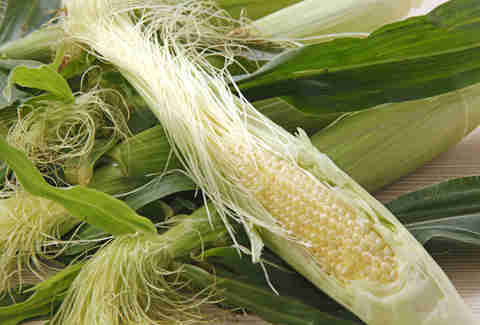 Those rotund, smile-sabotaging kernels we love so well don't make a showing in baby corn, along with much corn flavor, because the sugars and flavor they bring come after pollination. You wouldn't know baby sweet corn from baby dent corn, so it's not made from any one type of corn in particular. 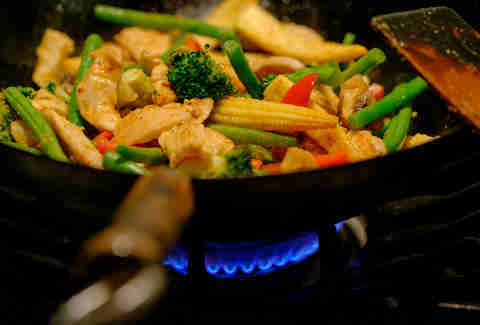 No, not the corn stork: Thailand (where they call it candle corn) is the main producer of the stir-fry staple. While the US is the main producer of adult corn, it's largely stayed out of the juvenile corn game, likely because of how much human labor baby corn requires. 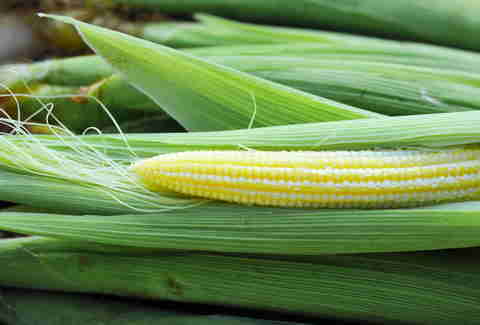 As soon as those corn silks mentioned above arrive, baby corn is harvested by hand. Whereas adult corn can be gathered with giant harvesters that are designed to strip an ear of corn right from its stalk, those machines don't work on baby corn. This means paying a lot of people to strip it by hand, which means low profit margins, and low profit margins are un-American. Unfortunately, baby corn doesn't travel particularly well. It's refrigerated and stored in cans or jars, preserved in water or types of acid, with salt or sugar. If you want your food to taste its best, this is not the route you go. This means what little flavor there is can be lost in transit. Like the human young, baby corn can't do many of the jobs we expect from grown-up foods: It doesn't have much nutritional value, and it doesn't have much taste either (again, it's not even pollinated yet). Its primary job is to look adorable and provide some texture to a stir-fry, but the vegetable can be a nice addition to soups, stews, or curries. It's rarely enjoyed on its own. To really get the most out of it, you'll want it harvested a few days after the silks appear and not shipped around the world, which is possible in the States, but not common. 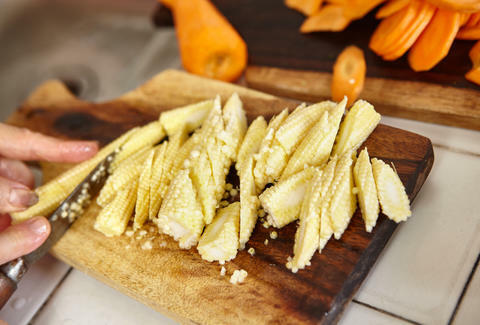 The test of fresh baby corn is similar to hearts of palm. It's always going to have mild flavor though, for the reasons already mentioned (lack of sugar and starch, among them). So the short answer: It doesn't taste like much. That's not necessarily a bad thing though. Not every veggie can be the sweet potato, nor should every veggie act like the sweet potato (kind of a try-hard self-promoter, to be honest). Sometimes you need a team player that rounds out the dish. Like good parents, let's judge baby corn by its own merits and ambitions, and let's love it for the humble role it was born to play. James Chrisman is a News Writer at Thrillist who is trapped inside the husk of his body. Send news tips to news@thrillist.com and follow him on Twitter @james_chrisman2.